What follows is coverage of a pitch thrown by a Tampa Bay Ray, a pitch that was taken and therefore not swung at. It was taken for a strike, and it was sufficiently unusual to end up sparking this post, but this isn’t really about pitch framing. Jose Molina didn’t even play, and while we’re here, just for the record, relative to Jonathan Lucroy, Molina gets too much framing love. It’s not that Molina isn’t outstanding. It’s that Lucroy is, quietly, similarly outstanding, but people forget about him. But this isn’t about Jose Molina or pitch framing. Good velocity, visible tail. Curious judgment, and you can see that Reynolds was caught a little off guard, not that he was going to make a big stink in the last inning of a blowout. And anyway, a few pitches later, Reynolds doubled. A few pitches after that, Carlos Santana homered, and the Indians ultimately won 13-0. Nobody cares about Rodney’s first pitch to Reynolds in the top of the ninth, except for me, and now possibly you. I’d like to hone in on this to search for a possible explanation. Well, no, that is demonstrably wrong. Sometimes the top and the bottom of the strike zone can get a little blurry. We’re not dealing with a pitch that was either too high or too low. Sometimes the camera angle can make the sides of the strike zone a little blurry. This camera angle is perfect, coming from right behind the mound. This pitch flew over the right-handed batter’s box. It didn’t graze the plate. The strike zone is more or less the width of the plate. There’s no question here: any umpire, looking only at this screenshot, would rule this pitch a ball. And you don’t need more than the screenshot. Fascinating research has found that the strike zone is significantly larger in 3-and-0 counts than in 0-and-2 counts. Those aren’t the only two counts where the zones are different, and there’s a strong correlation between zone size and pitcher- or hitter-friendliness. But we already said this was the first pitch of the at-bat. The count was nothing and nothing, so. Spot the outlier. So far these have been some pretty bad potential explanations. Behind the plate for Tampa Bay was not Jose Molina, but Jose Lobaton, who is a Jose, but who is not a Molina. Lobaton seems to be a good receiver of his own right, based on a limited amount of playing time, but he’s certainly not Molina-esque, or Lucroy-esque in keeping with my own advice. Let’s look at how Lobaton received this fastball. Did he get his pitcher an extra strike he didn’t necessarily deserve? I’m not going to pretend to be able to see what the umpire might’ve seen, but Lobaton caught this ball in front of his bicep, and not in front of his chest. He had to move his target quite a bit, and his arm travels in something of an ellipse. Molina probably would’ve “cheated” with his glove, gradually moving his target inward to account for the run on Rodney’s heater. Lobaton left his target in place until the ball was out of Rodney’s hand, with the result being inches of horizontal elbow movement. I don’t think Lobaton screwed this pitch up, but this doesn’t strike me as an exceptional frame job. Again, I’m not an expert in the field. There are two outs in the bottom of the ninth of a 13-0 baseball game. This is a 3-and-0 fastball that grazes the rule book inner edge. 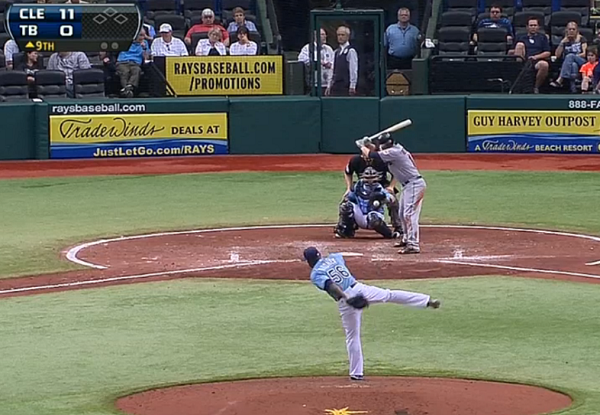 It was called a ball, and the Rays worked their second consecutive walk of the frame. There would’ve been almost every reason to call that pitch a strike, especially if the umpire were trying to get things to hurry up. Matt Joyce took his base. 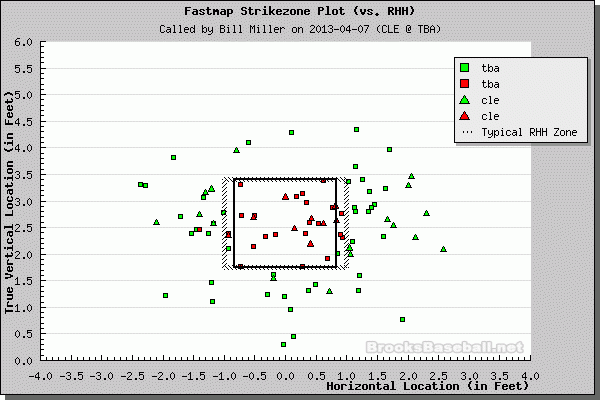 It’s not consistent with the idea of the umpire expanding the zone. The obvious one is the most likely one. Fernando Rodney threw a first-pitch fastball that was to become ball one. It was determined instead to be strike one, because the umpire is human and funny things happen in the course of human processing. Perhaps, on account of the blowout, the umpire was operating at less than 100% focus. Perhaps, if the score were closer and this same pitch were thrown, it would’ve appropriately been called a ball. One should never excuse a lapse in concentration, but if there has to be a lapse in concentration, a good time would be the ninth inning of an absolute blowout. There are worse mistakes to make. There are actual meaningful mistakes to make. And maybe the umpire was being more generous because the game was out of hand. Which leads one to wonder: should that be considered permissible behavior, or should the strike zone always remain the same? Should the zone be the same in all combinations of scores? Should the zone be the same in all combinations of counts? Is it better this way, or is it worse this way? If the human element can call this pitch a strike, might it call similar pitches strikes in closer games, games of greater import? How much can we take away from a single called strike in an 11-0 game at the beginning of April? Why do humans do the things they do? Why was this pitch called a strike? What did the umpire see, and what was the umpire thinking? It’s a completely insignificant thing, but from another perspective, it is the very most significant thing. We hoped you liked reading Explain a Strike by Jeff Sullivan! The catcher is set up inside and it looks like the umpire is set up a little further inside from the catcher. The pitch is centered nearly right where the umpire has set up. Probably makes the pitch harder to distinguish as being off the plate. Is it written that the umpire is supposed to position himself to be shielded by the catcher when the catcher is inside or outside the plate? It really does appear the catcher fooled him bc of where he set up. And if you notice in the last gif. the catcher set up middle in and reaches to the inside corner, and doesn’t get the call. There is something to this. One would hope a major league umpire would know where he is set up relative to the plate. I’m guessing the ump suddenly remembered he still hasn’t filed his tax return.